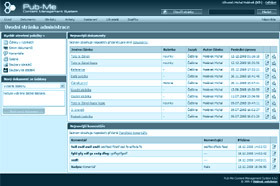 Pub-Me CMS is a modular system which means that you can expand its functionality by additional modules. This page brings a description of currently available add-ins. If you do not find the requested add-in here, it may be a standard feature of the system included in the basic installation. If not so, we can program a custom add-in to meet your needs. It is possible to add an unlimited number of polls to the web. Supports automatic grouping of polls – enables automatic displaying of an active poll, generation of archives of older polls, different groups of polls for different parts of the website or language versions. Full control of polls’ behavior – you can edit the number of options, change the order or text of options and questions even in case of already existing polls. Supports time-limited validity of polls (from – to). Set up validity of cookies. Define the language version that the poll belongs to. Supports (but does not require) AJAX for voting. Lock polls so that unauthorized administrators cannot modify them. Easy addition of a poll to a document in a form of an attachment. Polls are an add-in (i.e. are not included in the standard installation package). Upgrade your presentation to antoher level by not only presenting but even actively selling your products. Unlimited number of products and categories. Support of more stores within one website. Administration of orders and invoices. Full control of methods of delivery and payment. Template system for convenient addition of products and categories. Support of XML exporting (for example to price comparing sites). Support of logged-in users as well as orders by unregistered customers. The module adds more functionality to standard comments. Supports smilies in comments (the smilies are generated automatically). A module suitable especially for music bands, theaters etc. You can define the name of the concert, the tour, place, a link to the organizer, other bands, entrance fees. Can display the time of the beginning of the concert. Concert count. Canceled concerts are not included in the counter. Overview of the nearest concerts. Administration of courses and seminars. An overview of applied course attendants. Invoice generator (for needs of the company as well as students). The module makes it possible to send newsletters to subscribers. With this module, you can send newsletters. It supports several independent groups of addressees. Besides specific groups of addressees, it is possibel to send e-mails also to registered visitors of the website. Newsletter templates make it possible to create new e-mails with the same settings. This add-in takes care of administration and output of refrences. Reference preview image, www link, a brief and detailed description, description of carried out work. “Said about us” including a name of the quoted source. Selected references to be displayed randomly. This module makes it possible to run a single website on multiple domains. This add-on makes it possible to use more domains for a single website. Individual language versions, for example, can have their own address. Requires a special server setup. This module can be used, upon an agreement, for special website sections but it is not designed to create multiple complete websites with one license - for x websites you need to buy x licenses. Try the administration before you make any order. © 2005-2019 Pub-Me Content Management System, all rights reserved.